I find it hard to switch off and stop thinking about things. I let my mind wander and it really doesn't help my stress levels or my anxiety. To try and help this and also to have something to look back on in years to come, I have decided to keep a journal. On and off since I was a child, I have tried to keep a diary but have always failed. I'd write in it for a week or two and then stop for no real reason. I think my problem was that I told myself I had to write in it every day and sometimes I just don't have anything to say. Instead I'm just going to write in it as and when I feel the need. This might be every day or a couple of weeks could go by with nothing written and that is ok. So far I've really enjoyed it and feel it's very therapeutic to write all my thoughts and feelings down on paper. There's also something to be said for writing with pen and paper. It beats typing when it comes to keeping a journal. So when I decided to keep a journal, it took a while to find the perfect vessel. I wanted something timeless that I could imagine myself still writing in in ten years time. I had no idea where to look though so I headed to google and simply searched journal and came across The School Of Life website. When I saw their journal I knew that's the type of notebook I wanted. It's A5 and I love the linen cover. It isn't lined paper though, instead a grid which I have actually come to love. 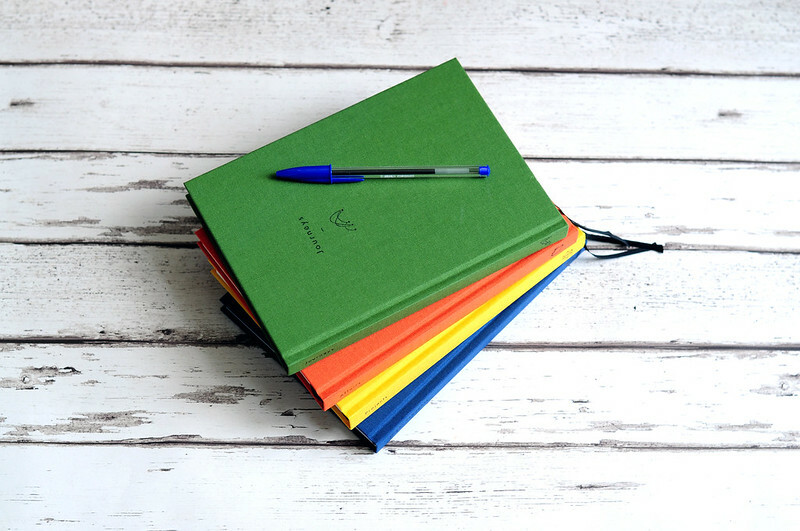 I bought the single green Journeys journal but have since bought the pack of four which works out a lot cheaper. I also had to pick a pen to write with and chose my favourite blue Bic biro. They are adorable!! I've always failed at keeping diarys/journals too! But they are really lovely. I've been trying so hard to keep a journal, but I find it so hard to get everything I want to say down especially when it comes to handwriting! I tend to do a lot better typing, but it's just not the same as writing everything in a notebook. I've gone through so so many journals since I was younger. When my mom was packing up our old house and going through everything I left in my old room she joked if she came across another half filled (or less) notebook she was going to lose it. It's been a while since I've tried to keep a daily or somewhat daily journal but I'm about to start. My friends very kindly got me one from anthropologie as a going away gift since I'll be studying abroad for a semester and it was such a perfect gift—now I have no excuse not to document everything while I'm traveling!